What is the purpose of MobaXterm? What are the main advantages of using MobaXterm over other SSH/SFTP/FTP/RDP/VNC/X11 solutions in Windows? Does MobaXterm perform unwanted internet connections? What is X11? Why would I need an X server? Why is my remote DISPLAY variable configured to "localhost:10.0"? I want to change MobaXterm X server DISPLAY address to my second network adapter (or my VPN adapter). How can I do this? How do the X11 tabs with DWM work? Why does MobaXterm include this "tiling" window manager? How can I simply launch the X11 server without starting the full MobaXterm environment? Does MobaXterm X server support OpenGL? How can I use hardware acceleration? How can I display a full remote desktop from a Unix/Linux server in MobaXterm (Gnome, KDE, FVWM, Openbox, Fluxbox, IceWM, XFCE, Blackbox, DWM, Enlightenment, LXDE, ...)? How can I use public SSH keys with MobaXterm? Can I perform a SSH connection through my SOCKS proxy? How can I send Ctrl+Alt+Del through RDP (terminal service)? What is the purpose of the "tunneling" tool? MobaXterm does not display correctly some special characters? I encounter problems with my country charset/encoding? I can not run a Windows application inside MobaXterm. My Windows PATH is not taken into account in MobaXterm. I want to paste in the terminal using right-click / I am using a laptop and I do not have any middle button on my trackpad. How can I paste text in the terminal? I would like to start MobaXterm from a BATCH script. How do I use MobaXterm inside my script? What are the command line switches available? I have a small screen and I would like MobaXterm to be more "compact" in order to maximize the terminal area (or remote desktop area) on screen. I would like to create a new plugin for MobaXterm. How can I do that? What is the best way to secure my MobaXterm installation? How can I backup/export my sessions? Is it possible to share a MobaXterm configuration between multiple users? Where does MobaXterm store its configuration or sessions? How can I select where to put the configuration (MobaXterm.ini) file? MobaXterm fonts are too small / too big. How can I change MobaXterm interface font size? How to disable the penguins screensaver? How to remove the "Games" menu and games entries from MobaXterm? I love the penguins screensaver! Can I subscribe to MobaXterm Professional Edition and keep it? I want to save my terminal output but when I choose the "Log all terminal activity to the following directory", I get a hardly readable file with special characters in it. Why does the SSH-browser tab not pop up when I launch a SSH session? / Why does MobaXterm prompt me for a password each time the SSH-browser is started? After connecting using SSH, I immediately get "Connection reset by peer" or "Software caused connection abort" error. My SSH connection freezes or drops out after N seconds of inactivity. When connecting using a SSH key, I get the following error message: "WARNING: UNPROTECTED PRIVATE KEY FILE!" When connecting to a SSH server, I get the following error message: "WARNING: REMOTE HOST IDENTIFICATION HAS CHANGED!" When I hit the "backspace" key, it does not work (or it outputs ^H or ^?). I want to ask for some support. Can you help me? 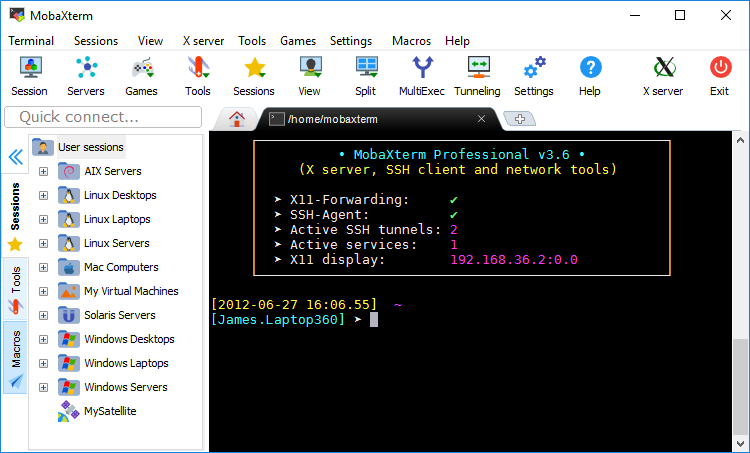 MobaXterm provides all the important remote network tools (SSH, RDP, X11, SFTP, FTP, Telnet, Rlogin, ...) to Windows desktop, in a single portable exe file which works out of the box. Some plugins can be used to add functions to MobaXterm such as Unix commands (bash, ls, cat, sed, grep, awk, rsync, ...). MobaXterm allows you to launch remote sessions. You just have to click on the "Sessions" button to start a new session. You can then choose to create a new SSH, Telnet, Rlogin, RDP, VNC, XDMCP, FTP, SFTP, Mosh or Serial session. Every session you start is automatically saved. You can edit, delete, move, import or export sessions by right-clicking on them in the left MobaXterm sidebar. You can also create a desktop shortcut in order to automatically launch a session or a group of sessions at MobaXterm startup. Right-clicking on a session folder allows you to launch many sessions at once. It can be really useful when you often work using the same environment and the same opened sessions. The multitab environment allows you to work with many terminals or remote sessions at the same time. You can toggle between "multitab" mode, "2-terminals" mode and "4-terminals" mode by clicking on the "Split" button. MobaXterm brings another really useful mode called "Multi-execution" mode. This mode allows you to display all your terminals at the same time and to write your commands to all of them at once: when you press a keyboard key, it will write the same letters on all your terminals at once. This mode can be activated by pressing the "MultiExec" button. A X11 server is embedded into MobaXterm executable. This X server is based on the well-known Xorg server and compiled in order to run natively on Windows platform. The X server supports OpenGL rendering and the latest extensions in order to allow you to run up-to-date applications through it. This embedded X server can also be used to render remote desktops: just create a new "XDMCP" session, then select your settings, verify that your remote server supports XDMCP and start your session. If this does not work or if you need some better security, you can also access your remote desktop through a secure SSH connection: start a new SSH session and in the "Remote environment" setting, choose the correct desktop you want to run a the remote server. You can tune your X server settings in MobaXterm global settings --> X11 tab. Be sure to select the right settings for your configuration. If you have a very old application which does not behave correctly with default settings, be sure to try one of the "Windowed" modes. The terminal provides a bunch of settings that can be tuned in order to suit your needs (font, background/foreground colors, antialiasing, old keyboards compatibility, ...). The default terminal parameters can be set by clicking on the "Settings" button. MobaXterm comes with useful Unix command-line utilities, but also built-in graphical tools such as a fast picture viewer, a developers text editor, a file/folder comparison tool, a ports analyzer and a packet capture tool. The feature which is in our opinion the most useful may be the graphical SSH-browser: when you log to a remote server using SSH, a graphical SSH-browser pops up on in the left sidebar allowing you to drag and drop files directly from or to the remote server using your secure SSH connection and SFTP or SCP protocol. In the SSH side browser, you can double-click on a remote file in order to edit it directly using your favorite program. Your changes will be saved to the remote server automatically! MobaXterm can start many independent sessions thanks to a tab-based interface. Use the appropriate button to create new tabs, close existing tabs, cycling through tabs or rename tabs. MobaXterm allows you to display some terminals in the same Window just as you would do using the "screen" utility. MobaXterm allows you to detach tabs in order to display them in a separate window. You can detach, reattach tabs or go fullscreen using the right-click menu on your tab. MobaXterm allows you to launch some light daemons (TFTP, HTTP, FTP, SSH/SFTP, TELNET) from the main interface. You can manage these daemons by clicking on the appropriate button from the top toolbar. MobaXterm allows you to create some SSH tunnels (a.k.a. "port forwarding") with a nice and intuitive interface: you can manage these SSH tunnels by clicking on the appropriate button from the top toolbar. You can store your connection settings in bookmarks that are stored in your INI file. Sessions can be accessed easily through the corresponding menu in the top toolbar or in the left sidebar, but you can also create a desktop shortcut to each session in order to launch them easily. This command allows you to open your local files. This command will open your documents using the Windows default association for your document type. You can open files, directories or URL directly from the terminal by simply Ctrl+clicking on them. This command allows you to work with dos/unix paths. You can obtain the Dos path from a given Unix path and vice-versa. You can also list your computer paths like the Windows, System, Desktop, Profiles and Start Menu paths. echo "/bin PATH = $(cygpath -w /bin)"
echo "System PATH = $(cygpath -u -S)"
This folder is a virtual directory containing your registry keys and values. You can open and read a registry key by doing a simple "cat" of these virtual files. You can execute native Windows programs from MobaXterm as you would in a "cmd" console. Do not forget that you can bookmark your connections using the bookmarks feature (see the corresponding section for more information). You can also set up passwordless connections with rsh or ssh, there is also a corresponding section to this feature. 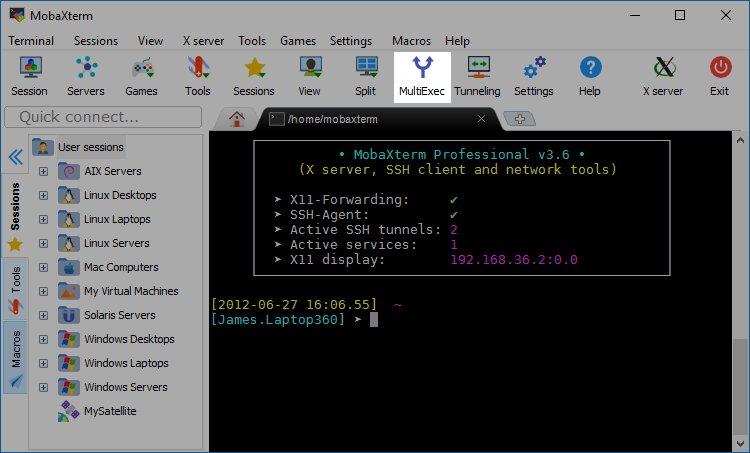 MobaXterm includes an X server so that it can display X11-based graphical programs. By default, an X server is started at MobaXterm startup. Your DISPLAY environment variable is automatically set and it is written in your terminal startup message. When you use a remote computing client to connect to a Unix computer, you can export your DISPLAY to your local Windows desktop thanks to MobaXterm. When you use a SSH connection, if the remote server supports X11-Forwarding, your DISPLAY is automatically set and it will be sent through the SSH connection to your Windows desktop. MobaXterm includes everything you need to edit text files: vi on command line, nedit for a graphical editor or MobaTextEditor which is a light but powerful editor for developers with textdiff utilities. Some commands can be added to MobaXterm thanks to the use of plugins. You can download some ready-to-use plugins at https://mobaxterm.mobatek.net/plugins.html . If you want to add more embedded tools to MobaXterm, you can download them easily using the "MobApt" package manager. The "global settings" window can be accessed through the "Settings" menu. In this window, you can configure and tune MobaXterm parameters in order to better suit your needs. Choose a folder that MobaXterm will use as its HOME directory (/home/mobaxterm). This directory will persist upon MobaXterm restarts, so you can store your SSH keys in it. Define the text editor that will be used for text files edition. By default, MobaXterm will use its embedded text editor "MobaTextEditor". Put a new entry to the right-click menu of Windows explorer "Start MobaXterm here". Choose a folder that MobaXterm will use as its ROOT directory ("/" folder). This directory will persist upon MobaXterm restarts, so you can store your programs in it. Note: This is especially useful if you use the MobApt tool. Define MobaXterm terminal font. This setting can be overriden in each session. Define MobaXterm terminal default charset. This setting can be overriden in each session. Show/hide the separation line between each command in local terminal. This allows you to launch Windows commands like "ipconfig"
Note: when this option is checked, contextual menu is still available using Ctrl+Right-click or Shift+Right-click. Uncheck this if you want the backspace key to send ^? Note: If you hide the scrollbar, you will still be able to scroll the terminal using Shift+PgUp or Shift + PgDown. Check this option in order to start X11 server at each MobaXterm startup. Warning: fullscreen mode only works on first screen. Starting offset for the "DISPLAY" parameter. By default, MobaXterm will try to open the ":0.0" DISPLAY, and will increment this variable if another X server already exists on this port. If you choose the "36" offset for instance, MobaXterm will start probing at DISPLAY ":36.0". - disable "copy on select": selecting some text will not automatically copy it, only explicit requests to copy text will be handled. If you have some troubles with a certain version of Xorg, this allows you to try an older Xorg release. - Restricted: Access control is enabled. You can use the "xhost +[...]" command in order to allow remote hosts to connect. - Full: Access control is disabled. Any remote X11 application can connect to the X11 server. Warning: remote applications can listen or simulate key strokes. In any case, X11-Forwarding will work flawlessly, without any popup warning, as the X11-forwarding connection is made locally using a secure connection. Check this setting if you want to avoid flickering effect on MobaXterm main window, especially when resizing terminal or when hovering buttons. Warning: this can slow down MobaXterm graphical interface. The "sessions manager" window can be accessed through the "Session" menu. The session manager window allows you you to create remote sessions, configure them using advanced settings and save them for further use. Specified command will be executed on the remote server after connect. You can specify multiple commands and separate them with ";" or "&&". Start a full desktop from your remote server in a new window. For instance, on Raspberry Pi device, you can start LXDE. Specify a private key for passwordless login. You can also create and manage your SSH keys using the embedded MobaKeyGen application (available in the "Tools" menu). Automatically place the graphical SSH-browser in the same directory than the SSH terminal. Note: This feature is experimental and it will not work on old Unix systems. this allows the remote server to be aware of the language and charset settings used locally. Note: the remote server should support these language settings. Display a graphical SSH-browser which allows you to browse your remote server content. Note: unlike FTP protocol, SSH-browser uses a secured encrypted SSH channel for transport. Type telnet username or leave this field empty if you want to use the "Login:" prompt instead. Note: Some telnet servers do not support this feature: even if you choose a login, they will still prompt you at each connection. If you check this setting, you will not be able to close MobaXterm as long as this session is running. Warning: fullscreen mode only work on first screen. This mode is recommended, especially if you are behind a firewall. In this mode, FTP client initiates the 2 connections (control and data), whereas in active mode, control connection is initiated by the client and data connection by the server. If this option is checked, MobaXterm will attempt to perform a FTPS connection to the server. If this option is checked, the channel used for data transfer (files, directory listings) will be encrypted, otherwise only command channel will be encrypted. Text files will be converted to Unix/Dos format during transfer. Warning: This feature is not suitable for binary files!! Select terminal font, choose encoding and font size. You can also force a fixed number of rows/columns. if your remote server is slow or cannot handle large paste buffers all at once, this setting can be helpful: when pasting huge buffers of data, it will add a small time delay after pasting each line in the terminal. If you check this option, any attempt by the shell to set tab title will fail. Uncheck this option if you want to allow the shell to change tab title. You can connect to an SSH server without supplying any password: this is useful if you want to run shell scripts that are not interactive. Copy the file that has been generated on the client (".ssh/id_rsa.pub") to the ~/.ssh/ directory of the server and rename it to "authorized_keys". You can connect to an RSH server without supplying any password: this is useful if you want to run shell scripts that are not interactive. Note that all these shortcuts can be configured through "Settings" --> "Configuration" --> "MobaXterm keyboard shortcuts" button. This command can be used to start a macro by specifying its name. Create a new bookmark, select the "Custom shell script" option in the dropdown menu and edit your shell script. You can then click on your bookmark and choose to create a desktop shortcut to this bookmark. click on "Share these sessions with my team"
click on "Settings", then on "Manage shared sessions"
This will add a new tree node in your sessions tree, in which you will find the shared sessions. - some unique features like the remote sessions with saved passwords or the SSH-browser: when you connect to a remote server through SSH, a graphical remote file browser will automatically be displayed allowing you to transfer files or to edit them directly using the integrated text editor "MobaTextEditor"
- a non-intrusive program: MobaXterm does not connect to the Internet or write entries into your Windows registry without asking before. It does not automatically check for updates. There is no time limit for using it. No, MobaXterm has been designed to just perform the connections you request: no background internet connection is done without your consent. Even the update mechanism is manual: MobaXterm will not search for updates if you do not click on the "Check for updates" menu entry. The X server (a.k.a. X11) is something very important in an Unix/Linux environment: it is the graphical layer on which all graphical applications are based. As X11 is a network protocol, applications that can display their graphical interface on a Linux/Unix desktop can also display it through the network on another computer as well. This 2nd computer only needs to run an X11 server to display them. MobaXterm includes an X11 server, based on "X.Org", that allows you to display remote graphical Linux/Unix applications on your local Windows computer with great speed and performances. With MobaXterm, it is really easy to use X11-Forwarding: just connect to your server and keep the "X11-Forwarding" setting checked in your SSH session. Then, from the remote server prompt, run "xclock". You will see the "xclock" interface which has been transfered through SSH on your Windows desktop. If you check the "DISPLAY" environment variable on your remote server, you will notice that it is set to something like "DISPLAY=localhost:10.0". This is the standard behaviour for X11-Forwarding: it means that any program will use a local virtual display (:10.0) which is created by SSH and which will be automatically forwarded trhough the SSH connection to MobaXterm display. By default, MobaXterm Xserver listens on all your network adapters. The banner message will say that your DISPLAY environment is set to "<some_ip_address>:0.0", but this is an informational message only: it is printed here in order to help users set their "DISPLAY" environment variable when connected to a remote server. However, the embedded X11 server listens on all network interfaces, not only the one which is written in. It does not matter which IP address you see in the "DISPLAY" variable: as MobaXterm X server listens on all your network interfaces, it also listens on the 2nd, 3rd, (...) network interfaces. For instance, if your computer has 2 network adapters (192.168.0.10 and 10.10.10.36): MobaXterm says your DISPLAY is set to "192.168.0.10:0.0". However the X server really listens on "127.0.0.1" (localhost), "192.168.0.10:0.0" (1st adapter) and "10.10.10.36:0.0" (2nd adapter). This problem can generally be solved easily by using X11 with a window manager instead of using X11 in "multiwindow" (transparent) mode: go to MobaXterm "Settings" window --> "X11" tab --> select "Windowed mode with Fvwm" setting in the combo box and apply. Restart your remote program and it should take keyboard input correctly. If you want to use the standard "multiwindow" (transparent) X11 server and occasionally use the windowed X11 server with the window manager, you can go to MobaXterm "Settings" window --> "X11" tab --> select "Multiwindow mode" setting in the combo box and apply, then open the "tools" menu and select either "X11 tab with Dwm" or "X11 window with Fvwm2". DWM is a powerful and robust window manager which implements a smart way of arranging windows in order to gain space. Windows are automatically placed side by side so that they all occupy the maximum available space on the desktop. - To move a window, use "Alt + Left click"
- To resize a window, use "Alt + Right click"
This will launch MobaXterm minimzed in the system tray and start the X11 server. MobaXterm X server supports OpenGL application with hardware or software rendering. - In order to switch from software rendering to hardware rendering (and vice-versa), you can use the appropriate setting in "Configuration" --> "Settings" --> "X11" tab --> "Enable hardware OpenGL acceleration"
- Go to MobaXterm "Settings" window --> "X11" tab --> select "Windowed mode" setting in the combo box and apply. This will run a windowed X11 server at MobaXterm startup instead of the default "transparent" X11 server. Connect to your remote server using "ssh -Y MY_REMOTE_SERVER" and then, run "gnome-session" or whatever window manager you want. If you want to use the standard "multiwindow" (transparent) X11 server and occasionally start your full remote desktop in a windowed X11 server, you can go to MobaXterm "Settings" window --> "X11" tab --> select "Multiwindow mode" setting in the combo box and apply, then start a new SSH session and choose the appropriate desktop in the "Remote environment" field. MobaXterm includes a SSH client (with SFTP and SCP) which allows secure encrypted connections to be set up through the network. 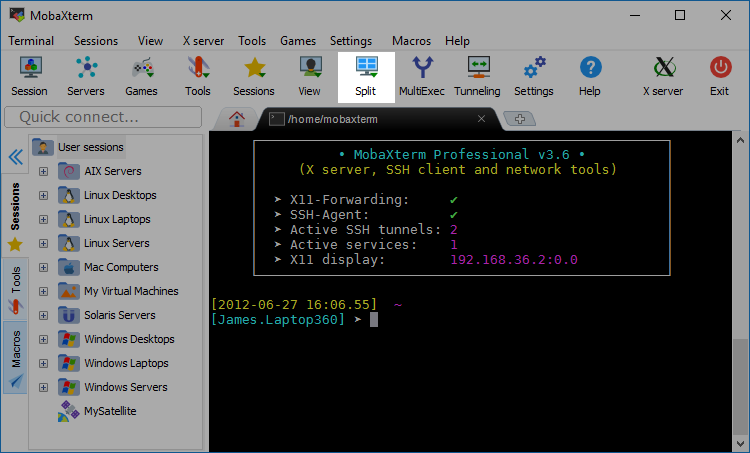 The SSH client embedded in MobaXterm is based on the efficient and secure SSH client PuTTY by Simon Tatham. Note: You can also use the graphical SSH keys manager "MobaKeyGen" (from the "Tools" menu). cat .ssh/id_rsa.pub user1@server1:/tmp/tmpkey && ssh user1@server1 "cat /tmp/tmpkey >> ~/.ssh/authorized_keys && rm /tmp/tmpkey"
Of course, you will have to set a persistent home directory if you want your generated keys to persist through MobaXterm restarts. A persistent home directory can be set in "Settings" --> "Configuration" --> "General" tab. Yes, since version 6.6 of MobaXterm, this feature can be set directly in your SSH sessions. RDP (a.k.a. "Terminal Services" or "TS") is a remote display protocol introduced by Microsoft for Windows OS. It allows users to connect to a remote host while displaying and interacting with the remote desktop using the local keyboard and mouse. You can tell MobaXterm to use "UTF-8" character set by going to the "Settings" menu --> "configuration" --> "Terminal" tab --> choose the "UTF-8 (unicode)" entry from the "Charset" setting. You can tell MobaXterm to use the Windows PATH by going to the "Settings" menu --> "configuration" --> "Terminal" tab --> check the "Append Windows PATH environment variable to MobaXterm" setting. You can tell MobaXterm to use right click for pasting by going to the "Settings" menu --> "configuration" --> "Terminal" tab --> check the "Paste using right click" setting. If you are using a session, edit your session, go to the "Terminal settings" tab and check the "Paste using right-click" setting. - Restart MobaXterm and try to double-click in the terminal in order to test your new selection setting. About launching MobaXterm from a batch file, you have many possibilities. For instance, let's say you need to start an SSH session from a batch file, keeping MobaXterm hidden and to launch an X application from that remote ssh server. C:\Some\place\MobaXterm.exe -hideterm -exitwhendone -exec "waitforX; ssh MYREMOTESERVER 'xclock' "
A full list of command line arguments is available in the "Execute a shell script at MobaXterm startup" section. There is a "Compact mode" setting which should suit your need: You just have to click on "View" --> "Compact mode" in order to put MobaXterm in a very basic interface mode. Note that you can still access the menu by clicking on the button at the right of the tabs bar. You can also detach MobaXterm tab by dragging and dropping the tab outside MobaXterm. - Rename plugin extension from ".mxt3" to ".zip"
You will notice that creating MobaXterm plugins only consists in putting the required commands (executables, libraries and configuration files) into a ZIP file, keeping the same folders tree than in MobaXterm ("/bin", "/lib", "/usr", "/etc"). - If you want to add a simple Windows program (exe file), you will just have to copy the executable file into the "/bin" directory, create the ZIP archive, rename it to ".mxt3" and put it in the same directory than MobaXterm executable. - If you want to add a Linux program, you will have to get it from the Cygwin project or to recompile it using make, gcc, g++ or other compilers that are available from the MobaXterm "Development" plugin. MobaXterm is already a secure program: its SSH connections are encrypted using well-known algorithms, its sources are available so that anyone can audit them, its passwords can be stored with strong encryption. However, depending on your company security rules, you can disable some features which may be considered as unsafe: in the "customizer" program, go to the "Settings" tab, then to the "Security" tab. Each setting can be leaved unchecked (less secure) or checked (more secure), you will have to make some choices between features and security. - if users do not use any of the embedded servers, we recommend to check the "Disable servers" box. - we would also recommend to disable unsecure protocols, such as telnet or rlogin and use SSH instead. In case an unsecure protocol is needed and cannot be replaced by SSH, then it can be "tunneled" through a secure SSH connection (you can use the "SSH gateway" setting in telnet sessions to do so). You can export your sessions by right-clicking on a sessions folder and choose "Export sessions from this folder". This will export your sessions to a file. You can then import these sessions to another computer using right-click on the sessions folder and choose "Import sessions into this folder". - With the professional edition of MobaXterm, the "customizer" program allows you to hardcode some sessions into MobaXterm executable and to generate an executable which will contain these sessions. You can then distribute this exeucutable to all your team members. 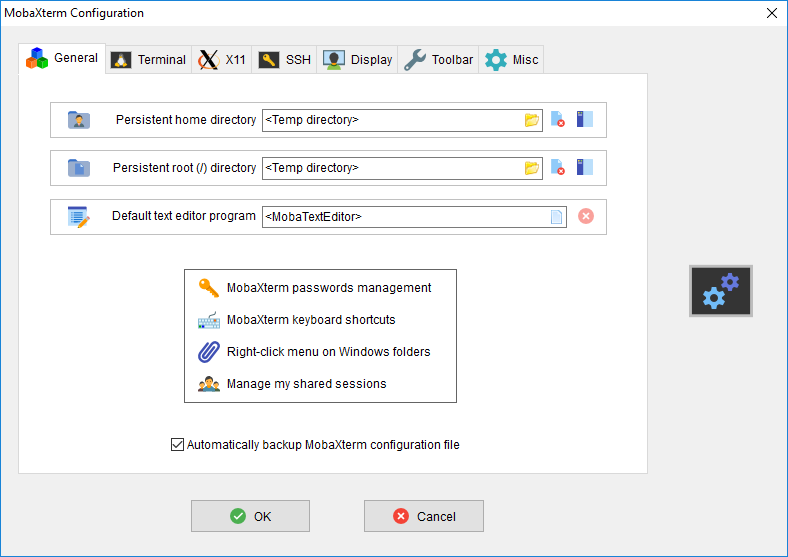 - Using any edition of MobaXterm, you can store MobaXterm executable and its "MobaXterm.ini" configuration file on a shared folder and tell your users to launch MobaXterm from there in order for them to get the sessions you previously configured. However, if you do not want any user to add sessions to the shared "MobaXterm.ini" configuration file, you should set this shared folder as read only. - You can put the "MobaXterm.ini" configuration file on a shared folder or on a web server. Then, if your users launch MobaXterm using the appropriate command line, it will tell MobaXterm to get its sessions from there. MobaXterm stores its configuration and sessions settings in a file called "MobaXterm.ini". You can use the "-i" commandline setting in order to determine the configuration file path for MobaXterm. You can use the "-dpi" commandline setting in order to determine the scaling factor used by MobaXterm for its graphical interface. The penguins screensaver and the games have been added to bring fun to MobaXterm terminal. Users who use MobaXterm inside a company might want to disable these tools in order to have a more convenient tool for working. That is why the Professional edition of MobaXterm allows you to disable the screensaver and to remove the games and corresponding menu entries from the program. We are glad you enjoy this screensaver: we spent a lot of time developing it! Of course, in the Professional Edition of MobaXterm, you can keep the penguins screensaver (and the games) if you want. If you just want to save the output from a terminal, please use the "Terminal" menu --> "Save terminal text". About the terminal logging, it can be used to log anything that is displayed inside the terminal. If you want to re-open a log file, please use MobaTextEditor in order to remove these special characters from the file. You should also verify if you have any "echo" commands in your profiling scripts on server side: as per the openssh FAQ at https://www.openssh.com/faq.html, if your startup scripts echo any kind of output, SFTP will not work. This is usually the result of a packet filter or NAT device timing out your TCP connection due to inactivity. You can check the "Enable SSH keepalive" box under "Settings" --> "Configuration" --> "SSH" tab. Enabling this option will ensure that the connection is kept "fresh" in the device's connection table. This warning is displayed when your remote host unique identifier has changed. This can be caused by a server re-installation, but it can also be a "man-in-the-middle" attack. Some console utilities don't interpret the backspace character (^H) as a backspace and need a delete instead. In this case, you can edit your session, go to the "Terminal settings" tab and toggle the "Backspace sends ^H" setting. It should allow for the "Backspace" key to function correctly without affecting how the command shell works. If you are using a session, edit this session and in the "Terminal settings" sub-section, toggle the "Backspace sends ^H" setting. - In case you encounter an issue, please describe precisely what happens (error message, freeze, etc...) and try to give us a step by step procedure we can follow in order to reproduce the bug. Please allow the "mobatek.net" domain in your email server so that our emails will not go to your SPAM folder. Also verify that you correctly wrote your email address in the contact form.